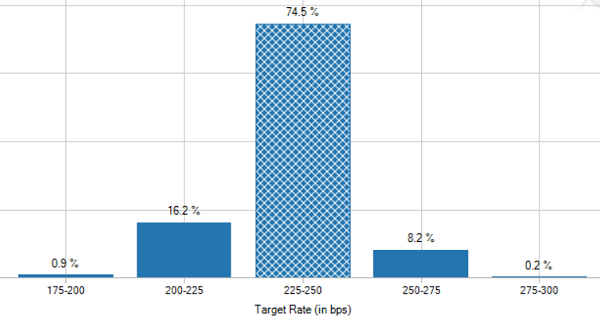 The last time we had this Fed setup, these safe 6%+ paying bonds jumped 20% in the year ahead! The setup? The likelihood that short-term interest rates (as set by the Federal Reserve) will go nowhere over the next 12 months. To see this we’ll turn to the Fed funds futures, which are contracts that reflect real money being bet on the Fed’s upcoming action (or lack thereof). Collectively they comprise the smartest crystal ball available this side of Jay Powell. This is bullish for – you’ll never guess – floating rate bond funds. We have a historical parallel we can draw on. In the summer of 2006, then-Fed chair Alan Greenspan capped off three years of rate hikes. 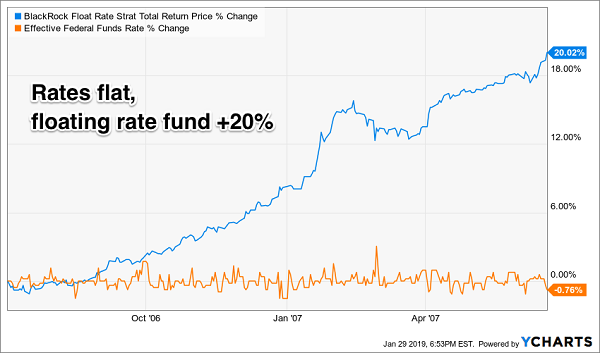 Contrarian Income Report favorite BlackRock Floating Rate Income Strategies Fund (FRA) continued to rally until the following summer, even though rates were going nowhere. The Fed rate remained unchanged while the 10-year Treasury rate traded in a range (between 4.4% and 5.3%). Interest rates were flat, yet floating rate fund FRA gained 20% in 12 months. Who would have predicted that! This big year was nothing new for FRA, either. Over the past 10 years, the fund has delivered impressive 11.8% annual returns on its net asset value (NAV), or the value of the bonds in its portfolio. And which bonds does it own specifically? Corporate bonds, which are issued by firms to fund future growth. FRA’s “secret” is that it buys bonds that are just below the “investment grade” demarcation. Blackrock’s managers David Delbos, Mitchell Garfin and Josh Tarnow know that it doesn’t matter what a rating agency says. What matters more is the actual health of the business issuing the bonds, its cash flow, and its ability to service the debt. So what’s our secret as income investors? We want to select excellent funds like FRA and buy and hold them when they trade at discounts to the value of the bargain bonds they hold. And at discounts so that you can snare some price upside to boot! Here’s why: CEFs (unlike their ETF and mutual fund cousins) have fixed pools of shares. Meanwhile, their prices trade up and down like stocks – which means these funds can sometimes trade at a discount to the value of their underlying assets! You can literally buy a dollar for less. As I write, FRA pays 6.2% today yet is priced at a 13% discount to its NAV (net asset value). Shares trade for just 87 cents on the dollar, the cheapest they’ve been in 10 years! If you’re interest in these funds, I’m guessing you’re keen to add at least one or two rock-solid monthly payers to your portfolio. I’ll bet you’ve even gone on the hunt for these “unicorns” yourself. If you have, you’ve probably run up against the No. 1 roadblock that keeps regular folks from building their own monthly income stream: strong monthly payers are almost impossible to find. That’s because, as you can probably tell from the 4 names I just shared with you, almost no big S&P 500 names pay monthly—so you need to venture to lesser-known corners of the market: investments like real estate investment trusts (REITs), preferred shares and, yes, closed-end funds. The good news? These are also the very same places you’ll find blockbuster dividend yields! Take the 21 stocks and funds in my Contrarian Income Report portfolio. As I write, these 21 cash machines pay an average 7.6% dividend yield! And best of all, ten send out cash dividends every single month! I want to GIVE you access to this entire monthly dividend portfolio right now. Plus I’ll also reveal the 3 monthly dividend plays I see as the very best additions to your portfolio today. An 8.4% payer that’s set to rake in huge profits from an artificially depressed sector. The brainchild of one of the top fund managers on the planet that’s giving out generous 9.4% yields. And a steady Eddie high yielder that barely blinks when stocks plummet. I can’t wait to share all my research on these rock-solid monthly retirement plays with you. Click here and I’ll reveal all 21 of the 7.6%+ payers in my portfolio, my 3 very best monthly payers to buy now and my complete monthly income strategy.